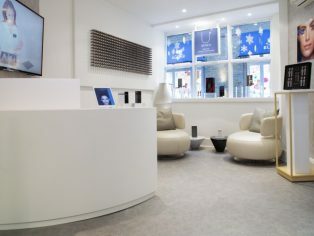 Luxury vinyl tiles from Polyflor’s design-led Expona Commercial range were recently chosen to create a sleek, modern look for innovative skincare brand GENEU Ltd’s flagship store on New Bond Street, London. Hard wearing Expona Commercial luxury vinyl tiles in the Exposed Concrete design were installed in the new Mayfair store where GENEU Ltd offers the world’s first in-store DNA test for personalised skincare. Managed by Karen Higgins Projects, this realistic stone effect floorcovering was used as part of the store design in main consulting and treatment areas. Featuring 55 stunning wood, stone and effects design options with surface textures for added authenticity, the Expona Commercial range of on trend luxury vinyl tiles has a 2.5mm gauge and 0.55 wear layer, making it suitable for high traffic, heavy commercial environments such as retail interiors. Expona Commercial luxury vinyl tiles are also further enhanced with PUR, Polyflor’s exclusive and robust polyurethane reinforcement which is cross linked and UV cured for a simple maintenance regime. Polyflor present creative flooring concepts for retail interiors in their brand new brochure, which also features a wealth of case studies from retail installations around the world. Visit the Polyflor website to read online or order your free copy. Samples of Expona Commercial luxury vinyl tiles can be ordered free of charge on the Polyflor website or by calling the Polyflor Samples Direct Hotline on 0161 767 2551. The Expona Commercial range is also 100% recyclable via the Recofloor vinyl take back scheme.